Sebastopol, Calif. -- Today at the Anaheim Natural Products Expo, the hemp foods company Nutiva introduced its new line of HempShakes. The organic superfood drink mixes are available in three flavors: Chocolate, Berry Pomegranate, and Amazon Açai. HempShake(tm) 16-ounce jars will retail at natural food stores for $19.99; 1.1-ounce single-serving packets for $2.19. The powdered shakes contain nourishing superfoods, such as hemp, blueberries, pomegranates, açai and goji berries, maca root, and ramon nuts, that are rich not only in protein but in minerals, antioxidants, and healthful fatty acids. Hemp protein contains 66 percent edestin—easier to digest than soy—and, unlike most soy protein, isn’t processed with hexane solvents. Whereas most shakes are low in fiber and high in sugar, Nutiva's drink mixes contain two kinds of fiber for good digestion and, in the Amazon Açai flavor, only three grams of sugar. Nutiva founder and CEO John W. Roulac commented, "The response from our retailers has been very positive. They love the packaging, the organic nutrition, and the story of how we source our ingredients." Nutiva has become America's leading hemp foods brand, with sales increasing 100 percent in each of the last three years, by focusing on the quality of its ingredients, processing, packing, and shipping. 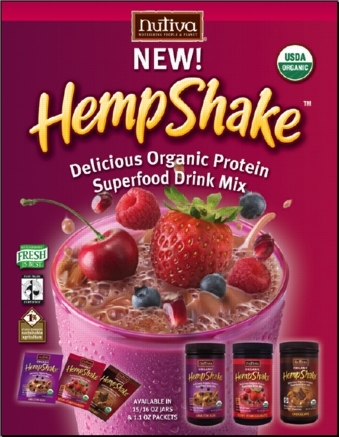 The HempShake(tm) brand is both organic-certified and Fair Trade-certified (fairtradecertified.org). Such products support family farmers through fair prices, community development, and environmental stewardship. Nutiva provides income for indigenous people by sourcing its Sambazon® açai berries and Brazil nuts from the Amazon rain forest, while its ramon nuts are wild-harvested in the Maya Biosphere Reserve. As part of its commitment to a more sustainable world, the company has chosen not to include scoops in its shakes. What they save in plastic, they will be donating in nutritious HempShakes(tm) to support good health for families such as those of the Lakota Nation. Since 1999 Nutiva has been demonstrating its mission to nourish people and planet by providing delicious organic superfoods and contributing to a healthy and sustainable world for all. The company offers hempseed, hemp bars, hemp protein, hemp oil, and coconut oil through 3,500 American and British natural food retailers, including Whole Foods Market, Wild Oats Markets, and The Vitamin Shoppe. Nutiva expresses its corporate citizenship by donating 1 percent of all sales to sustainable-agriculture groups. To learn more, visit http://www.nutiva.com, email John@nutiva.com, or call (800) 993-4367. Datwyler, S. L. & G. D. Weiblen 2006. Genetic variation in hemp and marijuana (Cannabis sativa L.) according to amplified fragment length polymorphisms. Journal of Forensic Sciences 51, 371-375. MINNEAPOLIS / ST. PAUL (3/22/2006) -- Using new DNA "fingerprinting" techniques, two University of Minnesota researchers have become the first to unequivocally separate hemp plants from marijuana plants with genetic markers. Hemp, a crop grown for durable fiber and nutritious seed, and marijuana, the most abundant illegal drug of abuse in the United States, both belong to the species Cannabis sativa. They differ in levels of the psychoactive drug tetrahydrocannabinol (THC) but are otherwise difficult to tell apart. The technique holds promise for distinguishing different cultivars (domesticated plant lines) in U.S. criminal cases. It may also prove useful in countries where the cultivation of hemp is permitted but marijuana is illegal, as in Canada and Europe. The work appears in the March issue (volume 51, No. 2) of the Journal of Forensic Science. The Cannabis plant has been cultivated for millennia and is important in the global economy as both a licit and an illicit crop, said Weiblen. Hemp is a source of durable fiber that provides an alternative to cotton fabric, among other uses. Cotton requires pesticide application and a hot climate, whereas hemp does not, which makes it suitable for local Minnesota agriculture. Weiblen seeks to screen a wider range of Cannabis cultivars to refine the technique. He is also working to identify regions of the Cannabis genome responsible for drug content in marijuana. If enough can be learned about the genome, it may one day be possible to produce an entirely drug-free hemp plant that looks different from marijuana. Currently, all hemp products are imported into the United States. Developing a new variety that could be cultivated in the United States would reduce American dependence on foreign products while creating a new alternative crop for American farmers. Copyright © 2005 Regents of the University of Minnesota. 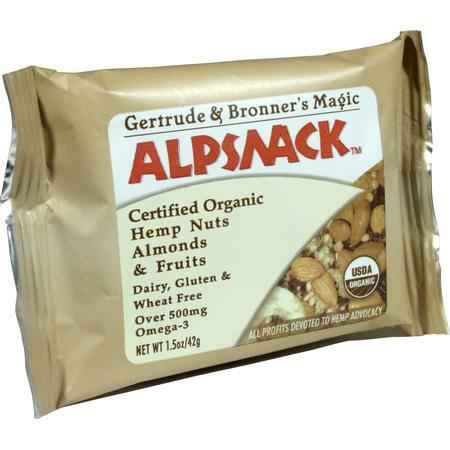 ESCONDIDO, Calif. -- Family owned Gertrude & Bronner's Magic Alpsnack(tm) is pleased to announce that beginning in April 2006 all five flavors of their popular snack bars will be made with certified organic 'fairDeal' hemp nuts. The fairDeal' is domestic fair trade certification for North American organic family farms. The 'fairDeal' ensures that farmers receive a fair price for their organic crops. Based on fair trade regulations these prices guarantee enough to cover the cost of production plus labor and profit which can be reinvested back into the organic family farm or local community. Since 2003 Alpsnack(tm) has demonstrated a commitment to fair trade by sourcing certified fair trade chocolate. Now with the 'fairDeal', for the hemp nut in Alpsnack(tm), they are able to reaffirm this commitment in a domestic context. The 'fairDeal' is third party certification that will ensure fair trade practices for family farmers and farm workers in North America. The Bronner family will be the first manufacturer to receive 'fairdeal' certification for hemp seed, a popular ingredient in health foods ranging from bread, cereal and salad dressing. "This is really a domestic fair trade program that will help small to medium size family farmers," says Alpsnack(tm) President David Bronner. "When people think about fair trade it's often associated with farmers in poor countries, but with family farmers in North America under attack by mega agribusinesses and unstable prices, this program will bring price stability and fairness farmers want." Fair Trade rules guarantee: a living wage in the local context, offering employees opportunities for advancement, providing equal opportunities for all people, particularly the most disadvantaged, engaging in environmentally sustainable practices, being open to public accountability, building long- term trade relationships, providing healthy and safe working conditions within the local context, providing financial and technical assistance to producers whenever possible. "Fair Deal" takes many of these "Fair Trade" practices in the developing world and applies them to the developed. "One of the reasons that consumers purchase organic food is because they want to support the family farm," says Rachel Swenson, fairDeal program manager. "Unfortunately because of the greater role of mega agrifood corporations in organics and the dumping of cheap offshore crops with dubious organic certification this is no longer the case. The fairDeal is a third party assurance to the organic consumer that they are in fact supporting the domestic family farm", adds Swenson. The Bronner Family is committed to help transition our major industries away from polluting, unsustainable materials and methods to cleaner, sustainable ones. To that end Alpsnack(tm), is a certified organic nutrition bar made with organic hemp nuts, almonds and fruits, that is dairy, gluten and wheat free, with over 500 mg omega-3 essential fatty acids. Hemp nut is the shelled seed from industrial hemp (non-psychoactive cannabis grown for fiber and seed) and is an ancient food source that supplies high amounts of omega-3 compared to other seeds and is an easily digestible, well-balanced protein. Fusarium wilt. The name strikes fear into the hearts of backyard tomato growers everywhere. Once introduced, the fungus Fusarium oxysporum can survive for many years in the soil. Fusarium wilt attacks a number of plants - food crops, industrial crops, and weeds. Your parents might remember the Gros Michel or 'Big Mike' variety of bananas. This variety was wiped out by Panama disease, or fusarium wilt, in the 1950s. A similar fate now befalls the Cavendish banana, the industry's successor the Gros Michel. Some scientists think that the Cavendish banana will be essentially gone in ten years. The banana is the world's number one fruit the fourth leading plant-based food in the world, after rice, corn and wheat. The International Network for the Improvement of Banana and Plantain and other organizations are working hard to get funding for research to come up with ways to halt the spread of the disease and come up with new cultivars of bananas that are resistant to this disease. What would you think if I told you that there were people in the world who are working on the weaponization of Fusarium oxysporum and that there are legislators ignorant enough to approve funding for this research? You would think that I was making it up because this kind of research went the way of the Cold War and Soviet research into fungus to wipe out the West's wheat and other food crops. Well, unfortunately you're wrong. (n) Requirement for Scientific Study of Mycoherbicide in Illicit Drug Crop Eradication- Not later than 90 days after the date of enactment of this Act, the Director of the Office of National Drug Control Policy shall submit to the Congress a report that includes a plan to conduct, on an expedited basis, a scientific study of the use of mycoherbicide as a means of illicit drug crop elimination by an appropriate Government scientific research entity, including a complete and thorough scientific peer review. The study shall include an evaluation of the likely human health and environmental impacts of such use. The report shall also include a plan to conduct controlled scientific testing in a major drug producing nation of mycoherbicide naturally existing in the producing nation. You would think that in the process of moving through the U.S. House of Representatives this paragraph would be noticed and removed. No one would want to vote for something like this, right? Sorry, wrong again. Only five representatives voted against it and it's off to the Senate now. You would think that the sponsors of H.R. 2829 would be proud of mycoherbicide research. In their respective press releases Congressman Mark Souder of Indiana and Congressman Tom Davis of Virginia make no mention of it. So, what does drug policy and Mycoherbicide in Illicit Drug Crop Eradication have to do with hemp? Plenty. In the Plant Protection Import Requirements For Hemp, Cannabis sativa the Canadian government specifically mentions Fusarium oxysporum f.sp. cannabis as a pest associated with hemp. There are many diseases of hemp and you don't want them in your country lest they kill your agricultural crops. Weaponized Fusarium has already been developed. Here is a scientific paper Biological Control of Infestations of Ditchweed (Cannabis sativa) with Fusarium oxysporum f.sp. Cannabis in Kazakhstan about the subject. Here is a presentation by AgBio-Con, Inc of Bozeman, MT to use this bio-weapon including high altitude delivery by C 130 cargo planes. The efficacy of these agents in attacking Cannabis is demonstrated in the journal article Killing Cannabis with mycoherbicides by John McPartland and David West. Interestingly the authors note that the species Fusarium oxysporum f.sp. cannabis is morphologically identical to Fusarium oxysporum f.sp. vasinfectum which has a very broad host range including crops such as cotton, rubber trees, alfalfa, soybeans, coffee, tobacco and hops. Hops (Humulus lupulus) are a very close relative to hemp (Cannabis sativa) and are used to flavor beer and ale. In this age of worldwide terrorism we need to seriously debate the ethics and legality of developing biological weapons that can be used against food and industrial crops lest they come back to haunt us forever. For more information please see the web sites of the Sunshine Project and Mycoherbicide.info. Checking the World Wide Web news, there's a lot of controversy about Google and its new business relationships in China. For those who haven't been paying attention, Google has agreed to censor its excellent search engine so that it can enter the Chinese market and keep up with its competitors Yahoo and MSN. For many people, the debate splits two ways: on the one hand, there are the commentators who are sticking to the classical adage that a business is in business to please shareholders by making money. And that it should, sensibly, adhere to the laws of the state it is doing business in. At the other extreme, there are critics who distrust market forces, think business and profit is inherently evil, and that Google must operate to a higher standard than the Pope, and possibly even Marx, would hard pressed to meet. The Hemp Report recently made the decision to pull Google ads from our web site because we believe in a third proposition: that a company can use the marketplace as a positive force for change. Our decision to get involved in hemp many many years ago, was the result of the desire to merge the heady ideals of changing the world, while meeting the practical necessity of putting food on the table. Not that we made much money from those ads (we are a rather specialised and low traffic site so Google ain't going to miss us). Nor in fact have ever really made money doing the Hemp Report. But I can tell you this: in our own quirky way, we must be doing something right, for the HR has served as a gateway for other opportunities that have rewarded us many many times over. These gifts have been personal, intellectual, creative and, oh yeah, financial. Now Google is one of the largest Internet-based companies in the world and working on a business scale that makes ours somewhat comical. And China has emerged as a massive trading partner for North America as well as a major investor in our domestic economies. Generally speaking, trade is much more constructive than boycotts or a heavily-armed policy of containment, and is definitely much more constructive than resurrecting the racist Yellow Peril of the 19th century. But you know, we are not just talking about goods such as energy, wheat, timber rights, mineral concessions and cheap Wal-Mart stuff. And not just services such as tourism, media, and education either. Modern business is also trafficking in the marketplace of ideas. For when you think about it, products are not solely physical artifacts anymore. They are also mental constructs. They have become Brands. Good Brands rely on the successful bundling of symbols and values with product. Ben and Jerry's is not just an ice cream company: they are also known for philanthropic and environmental leadership. The Body Shop is not just another soap line, they are promoting health and environmentally-progressive issues. And if you are successful in today's business, one of the more destructive things you can do is to work against the brand image that you have created. And when your brand is dependent on the idea of the free flow of information, supporting censorship is NOT the right way to present your message or your product. So as a media venture that believes in the free flow of information, HR is rather sensitive about certain issues. So when we have a situation where a western media company chooses to gloss over the fact that the Chinese government uses tanks to turn its own citizens into small pieces of bloody pavement, well, a line had to drawn in the proverbial sand. Google's corporate decision to self-censor their Chinese search engine puts them on the other side of that line. And since they showed that they don't match our values -- our Brand -- the relationship had to end. Bye bye. We think maintaining values is the Right Way to Do Business. Back to Hemp. There is a lot of Hemp opportunity in China (see http://english.people.com.cn/english/200111/04/eng20011104_83867.html), and while some companies are working with Chinese ventures, its very important that they do not take the regrettable route that Google has chosen. Your values come first. So if you are importing Chinese hemp textiles, don't buy ones manufactured through sweatshop labour. If you are importing organic hempseeds, make sure its Certified Organic and not "brownbag" or "backdoor" Organic. If you are buying hemp oil in bulk, please make sure its not rancid. And if you are selling Pedigreed Seed to them, what is in place to prevent them from pirating the genetic material? Taking short cuts will undermine your business. Avoid the race to the bottom, and work to bring Their standards up to Ours. Do not choose to overrun your ideals with tanks for a dollar.